April 8, 2016 | -by: Kevin George. Imagine you’re on a job hunting spree, and you end up applying for a job in your current company on a job portal. The only thought after this blunder in your mind would be “uh-oh… Besides focusing on the job responsibilities, I should have noticed the name of the employer too”. Well, at the end of the day, it’s a human error and you have to deal with it appropriately. 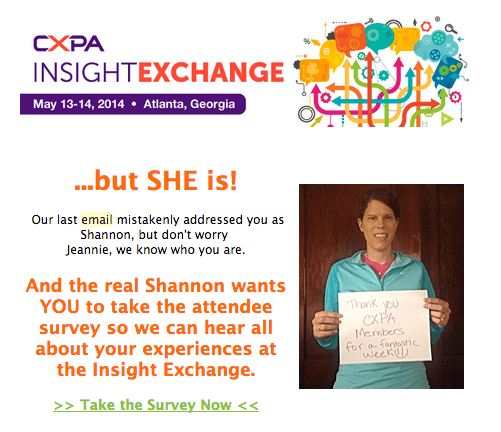 Well, Email Marketing is no less when it comes to human error. You may plan a fool-proof email campaign by setting the campaign goals – predicting an ideal ROI and selecting the best ESP. Yet your email campaigns might get hampered in case you commit a small error. • Do these mistakes affect your brand image? • How do you recover from these mistakes? • Should I send apology emails for any sort of email marketing mistakes? Well, these are a few of the many questions that arise at the onset of an email marketing blunder. It is quintessential to understand if the errors in your emails will have an impact on your brand image or offend your email subscribers. At the same time, it is debatable that whether it is really necessary to send a ‘sorry email’ or you just take a note of the mistakes for future campaigns. Let’s dive deeper into it and seek the blessings from Monks to get the answers to all the questions related to the recovery plan for some common email marketing mistakes. Erroneous or broken link is a huge blunder that email marketers dread. Imagine, you plan to link your CTA to a landing page, but due to broken link in your email you missed out on generating leads. Now, what do you do in case of a broken link? Well, you need to send a sorry email with fixed links to the subscribers who have already opened the email and have clicked the link. Whereas for subscribers who have not yet opened the email, or the ones who have opened the email but haven’t clicked the link; you can get the link fixed through your technical team. And there is no need to send an apology email too. 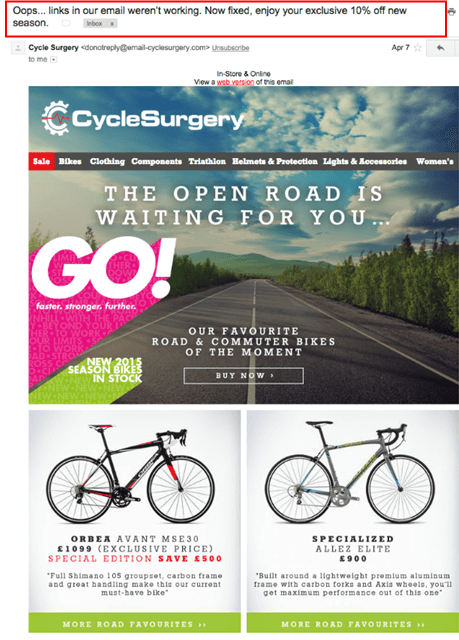 Have a look at CycleSurgery’s apology mail for sending an email with broken link. Segmenting and targeting are integral part of an email campaign. Promoting the right product/service to the right person is essential, or else you will find your unsusbcription rate go up. If you happen to send your emails to the wrong audience by mistake, analyze if the content or the topic of your email is too sensitive to hurt the sentiments of your audience. If it does, send an apology email immediately. 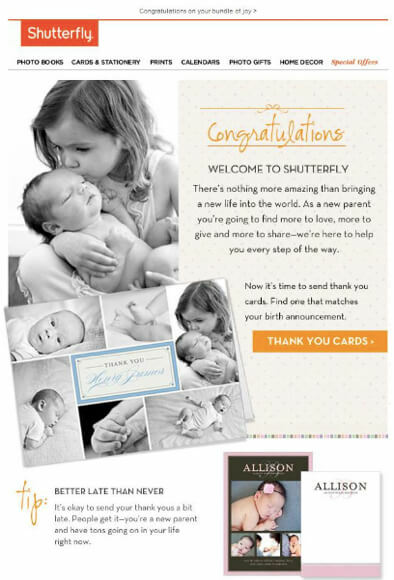 Shutterfly accidentally sent an email to all its subscribers congratulating them on their newborn children. However, in the process it hurt many for whom it was not intended or had unfortunate incidents of miscarriages. Well, they promptly apologized for the same as it had created uproar on social media. More often than not, email marketers commit the mistake of sending a test email to their email subscribers. 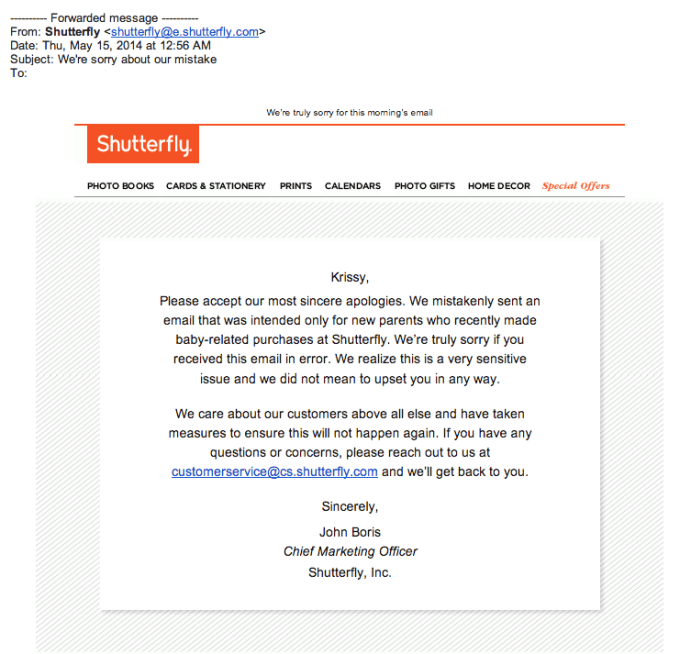 Well, as a marketer if you commit a mistake like this, immediately check if the email has been sent to your entire list. If not, stop the email campaign then and there. If the email hasn’t reached many people, you can take a call not to draw anyone’s attention by sending an apology mail. But, if your emails have reached a lot of mailboxes, acknowledge your error and apologize immediately. 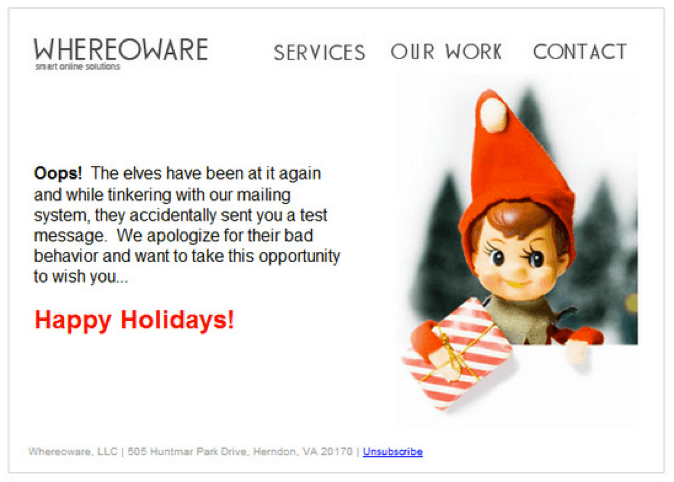 The example below showcases how WHEREOWARE apologized for sending a test email to its customers. 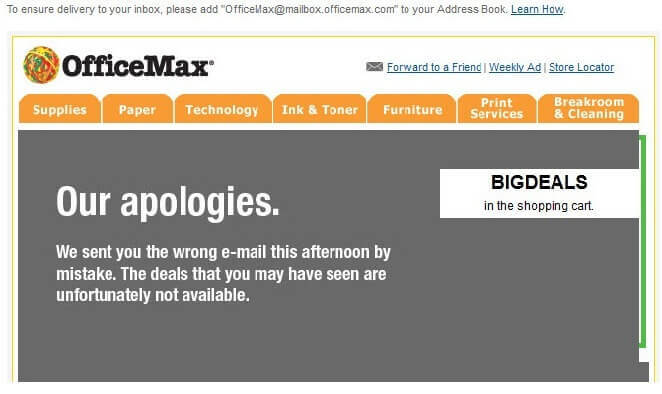 Sending an outdated or old deals email to your customers is such a blunder! Offering deals in an email that is no more valid will affect your email campaigns badly. If you commit a mistake of sending such emails, remember you have really got yourself in a soup. This mistake cannot be ignored and you have to take immediate recovery steps. Apologize the same day by sending an email campaign along with a valid reason for committing this mistake. • If you are sending an apology email, make sure you send it only to people who opened it. It’s okay if you don’t apologize to those subscribers who are not aware of the mistake. • You also need to check the unsubscribers list once you realize your email marketing blunder. You may wish to create a separate campaign (phone call or social media) to bring these subscribers back to your list. • As soon as you realize that you’ve committed a bizarre email mistake, make an attempt to contain the loss by sending an apology email immediately – preferably within a couple of hours. If you have committed an email marketing blunder, get in touch with us immediately for a customized recovery email template, designed & coded in just a few hours.